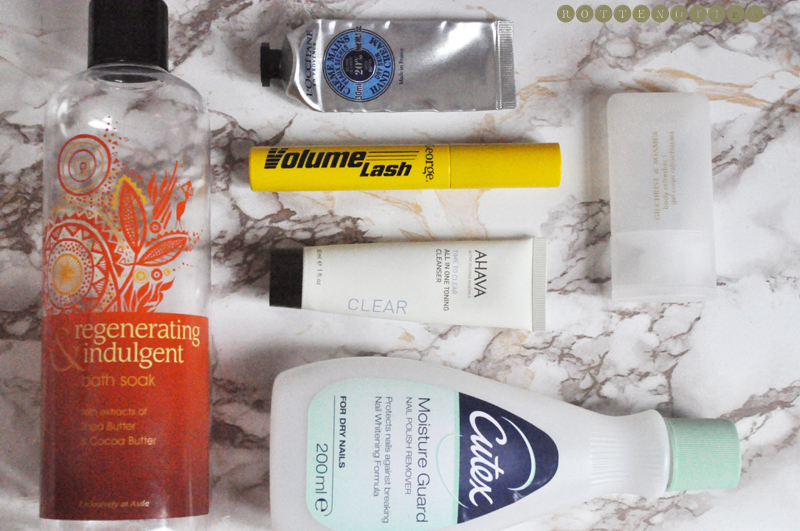 February always goes by so quickly, can't believe I'm already writing my empties and favourite posts! I seemed to have finished a surprising amount of products that I had to take two sets of photos. Have a feeling next month I'm not going to have finished that many. Regenerating & Indulgent Bath Soak - This is from Asda and I picked it up on a wim when I wanted something cheap to use in my baths on an everyday basis. I'm trying to make my Lush Christmas products last longer. Despite costing something ridiculous like 80p for a 500ml bottle, it's actually really good! It smells amazing as well and creates a lot of bubbles that last for the whole bath. If you have an asda near you I'd really recommend giving these a go. L'occitane Hand Cream - Sad to see this finished although I do have another one. I still don't like the scent but it's an amazing cream. Not sure if I'd buy one full price but I always make sure I get one when they're free with a magazine. George Volume Last Mascara - I actually picked up a brown one instead of black which was annoying. Teaches me right for not looking at the colour when I bought it. I really liked the black version but for some reason this is totally different. It takes for ever to dry on the lashes and I find it clumps together so looks like I have 3 lashes. Definitely wont be getting the brown one again. Ahava All In One Toning Cleanser* - I enjoyed using it but I'm not a fan of using a cleanser that you don't wash off on an every day basis. I just feel like it's not doing my skin any good with leaving it on. It's perfect if I'm feeling lazy but wont be buying a full size. Cutex Nail Polish Remover - This one is a bit of a cheat as I haven't really finished the bottle but as I decant it into a pump bottle I though I'd include it. To be fair, I only have a tiny amount left really. Hotel Body Wash - I always take these home with me when I stay in a hotel and always get my dad to bring them back when he goes on business trips. This one smells really nice but not sure of the brand or anything. Calming & Softening Bath Soak - I only just finished this bottle this month, it ran out on the 29th! Love the scent of this but it does say on the bottle Limited Edition so I hope I get still get it. Another bargain like the one above. 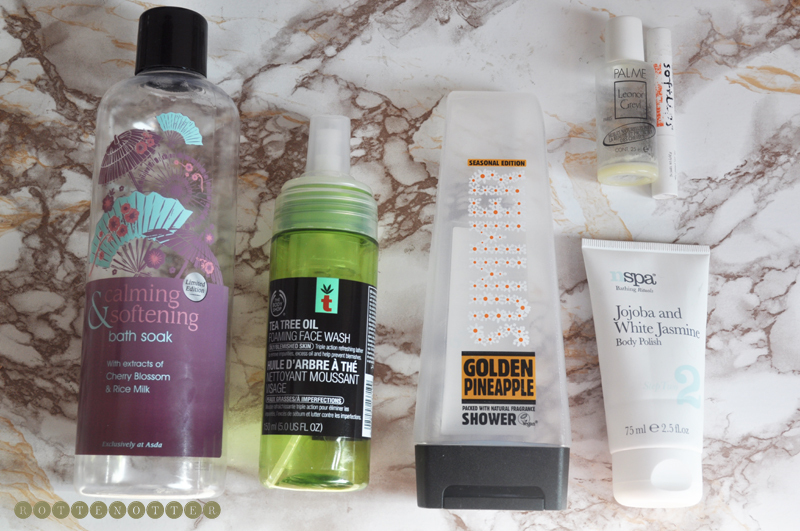 The Body Shop Tea Tree Oil Foaming Face Wash - I must have had this for a couple years now and only just finished it. I bought it when my skin was more oily but then my skin changed to really dry. I like the foaming aspect. It doesn't disappear completely like some other foaming cleansers do but it's just not suitable for my skin type anymore. Original Source Pineapple Shower Gel - One of my favourite shower gels, it smells amazing! I've already gone through a couple tubes of this and still have 2 left. I bought a lot when they were on offer for £1. NSpa Jojoba And Jasmine Body Polish - This again is another favourite, I just love the scent. If I could ind a perfume that smelt like this I'd buy it immediately. I'm not usually a fan of jasmine but for some reason I love this one. It also works amazingly well. Will be buying another tube when I go to Asda this week. Leonor Greyl Huile De Palme - I think I got about 4 uses out of this sample which I was quite impressed with as I have really long hair. I was expecting it all to go in one use. This is a pre-shampoo treatment which you leave on for 30mins and then wash out. I didn't really notice any difference so wont be buying a full size. Soft Lips Lip Balm - This isn't one of my favourite lip balms as I have other that work better so I wont be buying again.